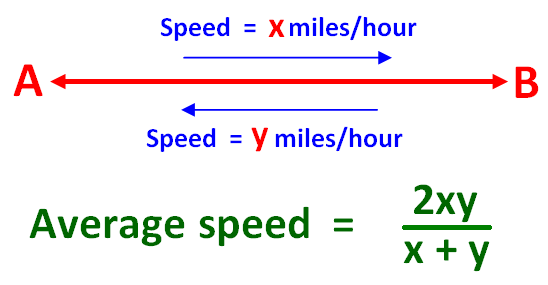 Average speed formula is used to find the uniform rate which involves something travelling at fixed and steady pace. If we want to find the average speed for the whole journey of three hours, we have to find the ratio between the total distance covered and total time taken. Based on the above example, the formula is to find the average speed is given below. Then, the formula is to find the average speed for the whole journey is given below. David drove for 3 hours at a rate of 50 miles per hour, for 2 hours at 60 miles per hour and for 5 hours at a rate of 70 miles per hour. What was his average speed for the whole journey ? = Total distance / Total time taken. Hence, the average speed for the whole journey is 62 miles per hour. Jose travels from the place A to place B at a certain speed. When he comes back from place B to place A, his speed is 60 miles per hour.If the average speed for the whole journey is 72 miles per hour, find his speed when he travels from the place A to B. Given : Average speed is 72 miles/hour. Hence, the speed from place A to B is 90 miles per hour. The distance traveled in both the ways (A to B and B to A) is same. A person takes 5 hours to travel from place A to place B at the rate of 40 miles per hour. He comes back from place B to place A with 25% increased speed. Find the average speed for the whole journey. Hence, the average speed for the whole journey is about 44.44 miles/hour. If the distances from A to B, B to C and C to D are equal and it takes 3 hours to travel from A to B, find the average speed from A to D.
Hence, the average speed from A to D is 20 miles per hour. We hope that the students would have understood the stuff given on "Average speed formula"
Apart from the stuff given above, if you want to know more about "Average speed formula", please click here.